You can find a Stackoverflow thread for a majority of API elements (classes), but the growth of availability occurs only linearly (despite an exponential growth in users contributing). We also found that API elements that were not frequently discussed on StackOverflow were not frequently used in practice (based on numbers we obtained from google code search). API designers may want insight into the “hot spots” that are problematic for developers or may have “gaps” in coverage. For example, we observed that not many developers talked about accessibility or DRM in Android. We have a treemap visualization tool that helps visualize the coverage and usage data of API elements in a treemap. 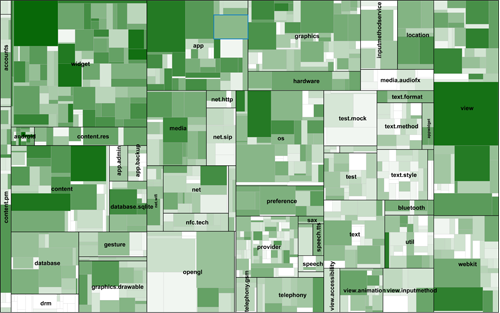 Play with the Android Treemap. Play with the Java Treemap. And one more thing. 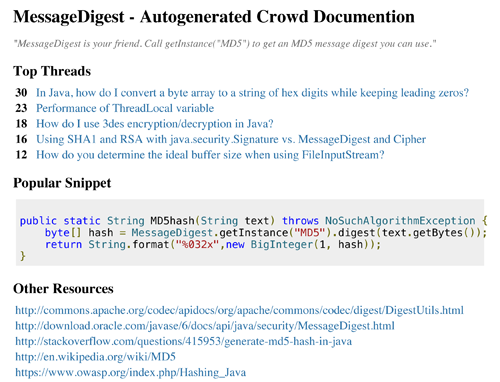 Given all the data about API elements from the crowd, is there something more we can do? Read our preliminary technical report for more detail. We go into more detail about traceability links to code examples and the effects of filtering out questions and answers based on filters such as vote scores or views. _“Crowd Documentation: Exploring the Coverage and the Dynamics of API Discussions on Stack Overflow”. _Chris Parnin, Christoph Treude, Lars Grammel, Margaret-Anne Storey.